Chisapani – Nagarkot Trek is one of the most popular treks near to Kathmandu. It is popular destination for domestic as well as international tourists. The Chisapani- Nagarkot trek is also one of the best family treks in Nepal. The trek is popular for the perfect eyeshot of the sunset and sunrise views and the beautiful mountain views. Chisapani Nagarkot Trek provides you opportunities to explore the majestic beauty of Nepal, the lifestyles of people, their cultures and an experience of village life. The Chisapani-Nagarkot Trek starts with a short 45 minutes drive from Kathmandu to Sundarijal. The original trek begins from here. After you reach Sundarijal the trial goes begins with an uphill climb for about two hours after that you will stop at a beautiful village called Mulkharka. Mulkharka is a traditional tamang village where you will see houses built of stone and mud which reflects typical Nepali houses and also explore the lifestyles of the people. After a few minutes rest in MulKharka the trial then passes through Shivapuri National Park which covers an area of 159 km.sq. The national park comprises three districts Kathmandu, Nuwakot and Sindhupalchowk adjoining 23 Village Development Committees. On a clear weather day the beautiful view of Kathmandu can be seen. It is about 5-6 hour trek from Sundarijal to Chisapani. You will explore the beautiful views of the mountains and spend quality time in the beauty of nature. The next destination is Nagarkot. The next day we will hike to Nagarkot from Chisapani which take abou 6-7 hours. 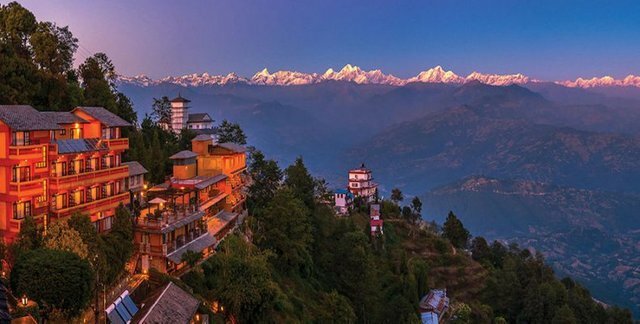 Nagarkot is famous for the sunrise view and the views of the snowcapped mountains including Mt.Everest and other mountain ranges of eastern Nepal like Annapurna Himalayan Range, Manaslu Range, Langtang Range, Rolwalling Range and many other ranges. Nagarkot is one of the best destinations for nature lovers and short-time traveler and hikers. The easy walk through evergreen forests, typical Nepali villages, exotic rivers and waterfalls are the main attraction of Chisapani-Nagarkot Trek which makes this suitable for family treks. Moreover, you will also explore the flora and faunas along your trial. Chisapani- Nagarkot Trek offers the best views in every season and thus this trek can be done all year around. Day 01: Kathmandu-Drive to Sundarijal-Hike to Chisapani. Day 03: Chisapani- Hike to Nagarkot. Kathmandu-Drive to Sundarijal-Hike to Chisapani. The trek starts from a short 45 minute drive to Sundarijal from Kathmandu. After then you will have a steep uphill climb for about one hour which takes you to Mulkharka Village. After about 4 to 5 hours of uphill and downhill walk we finally reach to Chisapani village. There you will see few hotels and lodges. The area is wide open space tucked in between beautiful Himalayan ranges and green mountains. The sunrise view and sunset views from here are spectacular. Overnight at Chisapani. We will have our early morning breakfast at Chisapani with the beautiful views. After having breakfast we will roam around the surroundings capturing beautiful pictures of the sceneries and then start our trek to Nagarkot. We will pass by few villages and lush green forest from Chauki Bhanjyang. The views along the trials are beautiful. After about 6-7 hours of walk we will reach to Nagarkot. Nagarkot lies at the rim of Kathmandu valley. It is best known for the eye catching scenery of white snow capped mountains, and striking sunrises and sunsets. Overnight at Chisapani. After early morning breakfast we will spend few times roaming around Nagarkot. We take a tour to Nagarkot. Nagarkot has numbers of hotels and lodges in comparison to Chisapani and you can expect more numbers of tourists here. After spending few times there we will drive back to Kathmandu. It takes about half an hour from Nagarkot to reach Kathmandu depending upon road conditions. After reaching Kathmandu you can also visit different cultural heritages sites like Pashupatinath Temple, Monkey Temple, Kathmandu Durbar Square and many other sites.Overnight at Kathmandu. English speaking trekking/hiking guide with government license. All meals during the trek/hike. Arrangements of the permits in case needed. Best available accomodation on twin sharing basis. All other expenses not included in the itinerary. International Airfares and Nepalese visa fee. There is not such requirement for this trek. However you should pack your trekking backpack according to the season you are trekking. For example if you are trekking in Monsoon you must have umbrellas, raincoats and waterproof shoes and other required elements that helps you to walk in rain. Likewise if you are trekking in winter your backpack must have warm clothes such as woolen cap, jackets, gloves and other. Also if you are trekking in summer your backpack must have items that will help you to walk in sun like sunscreen creams, light clothes, hats etc. Make sure your backpack contains comfortable trekking shoes and clothes and it is better if you avoid jeans.